A couple of years ago, there were some ice-tolt competitions (tolting / racing on ice) and exhibitions put on in North America. Altho this can be exciting for some, there are those who are concerned for the health of the horse, the stress, and long-term soundness as a by-product of these types of exhibitions. We know that heel caulks cause a great amount of torque on the legs of a horse. 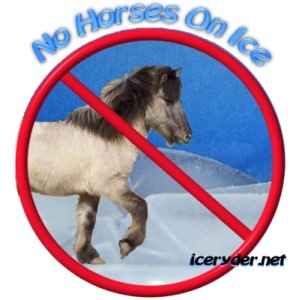 Ice nails and any other kid of non-skid devices worn by the horses would also cause torque. Let's look at it this way: Say you're going dancing.... there's a nice, shiny, waxed wood floor.... what would be the best sole to have on the bottom of your dance shoes? Probably suede or leather, so that you can slide your feet easily. What if you wore rubber soles or soccer shoes? Could you dance and slide your feet easily? or would you get hung up here and there? how would that affect your dancing? your body? your joints? The tolt is a gait wherein the horse is balancing his weight and the weight of his rider on one foot at times. This, in itself, is quite stressful. Now to do it on ice, seems like it would increase the stress. For a breed with a high percentage of spavin, it may not be a good idea to use traction devices, particularly with a horse whose gait includes a sliding of the foot. Another consideration is the Horse Protection Act. This federal act protects horses from being sored by any method. Concussion is a method of soring. Racing (running, working horses on ice, whatever you want to call it) ended a long time ago in the US. What about our respecting our own culture? A horse's pounding front feet on hard surfaces is a recognized method of "road founder", and can cause changes not immediately recognizable as lameness, but challenges the integrity of the structure of the feet and long-term soundness. The Icelandic Horse is prone to spavin; why take a chance or initiate this process sooner / faster by increasing the torque on the hind legs with nails in the shoes? 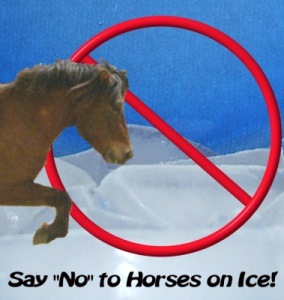 The biggest consideration is the liability of someone, possibly a child, as a result of seeing this type of show, taking their horse onto a lake or pond or other ice that may not be as solid as that found in Iceland and getting hurt, or drowning.